I don't have a great sense of what Gore Verbinski is all about. I saw The Ring in 2003, was terrified by it, and still get chills whenever I think of its long-haired antagonist climbing out of the TV. From there, I never saw another film of his, barring the sometimes interesting, sometimes meandering 2005 Nicolas Cage-starrer, The Weatherman. But if you were to sit me down and ask what the override aesthetic in Verbinski's work was, I might say, a good deal of style. And...? (My face would quickly reflect the fog that enshrouds my mind on the subject). Regardless, yes, I sure did like The Ring. And on first blush, A Cure For Wellness seems to hearken back to that same creepy imagery Verbinski built his career on in the first place. Set in and around a European "wellness spa", Mr. Lockhart (Dane DeHaan) is tasked with recovering his company's CEO from said spa in order to secure a merger that will make both he and the members of his board incredibly wealthy. Lockhart is a troubled man with a past marked by loss, which we see flashes of every now and again as he embarks on his journey to Switzerland. Once he arrives, he the wellness retreat is built upon the old ruins of a burned down castle with a tragic backstory of its own. That backstory comes with a bit of an antagonism between those that run and participate within the facility and the townspeople, who live an impoverished existence, a relationship not unlike something presented in Metropolis or even James Whale's iteration of Frankenstein. And much like those paragons of classic cinema, what's happening at the top of the mountain is quite out of the ordinary. Lockhart's CEO is unwilling to leave until the bizarre treatment regiment that digs deep into the history of the area finally "cures" him, while Lockhart's his own sanity and physical wellbeing are strained as he looks further into the treatment's methods. 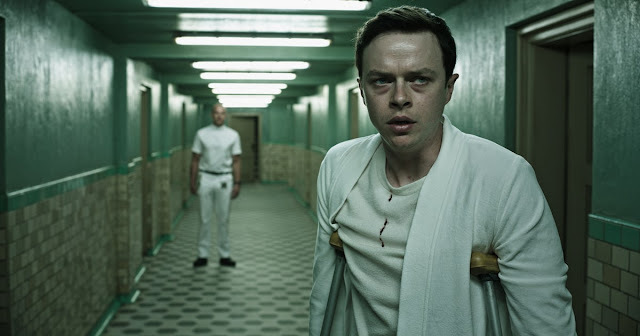 There's a wonderfully creepy movie within A Cure For Wellness' particularly in the first 45 minutes or so, when Lockhart is first introduced to the machinations of the spa. Verbinski and cinematographer Bojan Bozelli create a chilly atmosphere not unlike that of the director's breakthrough feature, including one sequence that outright plays homage to the famous videotape of that film. There's a Jeunet-like absurdist strain that Verbinski plays fast and loose with that highlights the inherent terror of aging - that our once perfect bodies will inevitably begin to sag, our teeth and hair will fall out, our minds will begin to fail us. For that opening act, A Cure For Wellness makes a strong case for its own existence, acting as a seeming return home for a filmmaker who has not played in these confines in more than a decade, while also playing - if a bit broadly - to our basest instincts. But: A Cure For Wellness is two and a half hours long. Verbinski and screenwriter Justin Haythe have little other story to tell here beyond that first 45 minutes that is even remotely a match for the visuals presented. A pretty miscast Dane DeHaan - who it needs to be said, drinks water in the weirdest fashion I've ever seen - tries to escape but he can't, tries to escape again but he can't, ad nauseum. And when DeHaan's character isn't trying to find his way out of the spa, the script goes to great pains to unveil another detail about the former master of the estate: the ubiquitous Baron and his sister, whom he wanted to marry. The film constantly takes the opportunity to remind you of the former Baron's creepy backstory, to the point that some passerby Lockhart engages with will just go ahead and say "Remember the Baron who once owned the castle that was killed by the villagers?" For a film that makes its enigmas so paramount, it's strange to see it treat its audience so disdainfully. This is also where Verbinski and company take the entire effort into a much duller, thriller-esque direction. This comprises about an hour and some change of the film's middle section. Had it stopped there, there's a very clear cut-off point that might have served as an adequate ending in a sort of tragic, if predictable vein. Instead, this is where A Cure For Wellness decides to take as hard a 90 degree angle as I've seen in a film in quite some time. Suddenly a visually striking, if lethargic mystery film transforms itself into a monster flick of the Universal variety (but not the good Bride of Frankenstein kind). This is straight out of Van Helsing. The villain of the piece becomes an unstoppable Terminator-like killing machine a la Robert Englund in The Phantom of the Opera, in an underground laboratory, while people dressed up like pseudo-KKK members waltz at a lavish ball in the floor above - and that's not even the stuff that made our audience laugh out loud. I'd say you'd have to see this thing fall apart to believe it, but then you'd have to waste almost three hours of your life for something that isn't quite insane enough to reach Gods of Egypt party-watch levels. Also, eels play a significant role. I'm still not sure why. Beyond looking great throughout, there's little else to offer here, you'd be better off treating your family to a nice steak dinner and watching something on streaming. Surely, your couch is more comfortable than that theater seat anyway.